Opening: Owen McPhee doesn’t just like to talk. He loves to talk, morning, noon, and night. Owen spends every waking minute chattering away at his teachers, his classmates, his parents, his dog, and even himself. But all that chatter can get in the way of listening to important instructions from the teacher during a science experiment. Not only does he mess up his own project, he messes up another group’s project. His chatter spoils story time. Even his classmate are annoyed and yell “quiet” when they’ve had enough and exclude him from playtime. When Owen wakes up with a bad case of laryngitis, he resorts to writing down the things he wants to tell his classmates. When he can’t write fast enough, it gives him a perfect opportunity to observe and listen to what others have to say. He may just learn something or have something to offer in a different way. From the author-illustrator team behind The Invisible Boy comes a bright and lively picture book that captures the social dynamics of a busy classroom while delivering a gentle message about the power and importance of listening…not only with your ears but with your heart. Trudy Ludwig’s newest treasure, “Quiet Please, Owen McPhee!” is the perfect resource for home and classrooms. Many children — and adults — talk to much. And their nonstop chatter may cause problems, that include loneliness because everyone wants to avoid a chatterbox. But, Ludwig tackles this subject with humor and wisdom as she lets a spirited Owen find his own way of learning to listen to others. Owen doesn’t change overnight, but he realistically works hard to control his chatter. This story also reminds readers that it’s important to put others first. There is so much heart in Owen’s journey. Ludwig once again teams up with illustrator Patrice Barton, whose colorful pastels are lively and dramatic. Barton brilliantly captures the dynamics between Owen and his classmates through page after page of priceless expressions! Children will also enjoy the great use of speech bubbles, which show how chatty Owen is. Check out the book endpapers. Resources: The author has prepared Questions for Discussion that teachers can use in the classroom to personalize Owen’s story. Parents will also find the discussion questions useful. TRUDY LUDWIG is a nationally acclaimed speaker and an award-winning author who specializes in writing children’s books that help kids cope with and thrive in their social world, including My Secret Bully, Confessions of a Former Bully, and The Invisible Boy. An active member of the International Bullying Prevention Association and a contributor to Sesame Workshop, Trudy has received the Mom’s Choice Gold Award, the IBPA Gold Benjamin Franklin Award, and the NAPPA Gold Medal, and also been recognized as NCSS-CBC Notable Social Studies Books for Young People. Visit her at Trudy Ludwig on her website. Follow her on Twitter at @TrudyLudwig. *Review copy provided by the author. Synopsis: Alter Wiener was a 13-year-old boy living with his family in Chrzanow, a small town in southwest Poland. His home was filled with love, laughter, food and books. Every Friday they shared their Sabbath dinner with a student or homeless person. When the German Nazi soldiers invaded and occupied Poland in 1939, Hitler ordered his army to imprison and kill millions of Jews. Alter’s father and older brother were taken when he was 13. The Nazis came for him when he was 15. He was moved to many different prison labor camps where the conditions were deplorable. The prisoners wer treated cruelly, given very little food and forced to work long hours. Years passed and he found himself working in a German factory. One day he began receiving a daily gift from a stranger who he thought was his enemy. Her kindness gave Alter the hope to survive. Why I like this book: Trudy Ludwig has treated Alter Wiener’s story about surviving the Holocaust with great compassion and dignity. Since it is a picture book, she doesn’t go into detail about the atrocities that occurred during WW II. Instead she focuses on the fact that not all Germans were filled with the hatred and risked their lives to help the Jews. 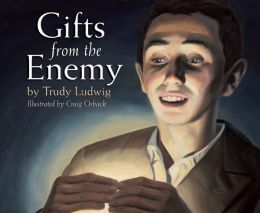 Gifts from the Enemy is an excellent introduction to the Holocaust for young readers. It also is a timely classroom book for children to understand the dangers of hatred, prejudice and intolerance. It is critical that as a society we begin to encourage kindness, compassion, and goodwill among our children so they will have the tools to stand up to social injustice and make sure genocide is a thing of the past. Craig Orback’s illustrations are breathtaking and realistic. His oil paintings capture the fear and darkness of that time in history. Resources: There is a beautiful afterword from Alter Wiener, who wrote his memoir From a Name to a Number: A Holocaust Survivor’s Autobiography. Trudy Ludwig provides a wealth of resources for teachers to use in the classroom. She includes information about the Holocaust, questions for discussion and recommended activities for young readers. You may want to visit Trudy Ludwig on her website. She is a nationally acclaimed speaker and author whose work helps empower children to cope with and thrive in their social world. Craig Orback has illustrated over 20 children’s books, including The Can Man and Nature’s Paintbox. Synopsis: Brian feels invisible to his teacher and friends at school. He is with them, but not really. At lunch he eats alone. At recess the other kids don’t pick him to play on their kick-ball team. During class when the other children play board games and read, Brian draws dragons, pirates, space aliens and super heroes. When Mrs. Carlotti introduces Justin, a new student to the class, the other kids poke fun at his Korean lunch. Brian draws Justin a special picture to make him feel better. Justin invites Brian to work with him on a school project. Brian’s artwork shows his unique talent and the students notice. What I like about this story: What child has not felt invisible at some time in school. 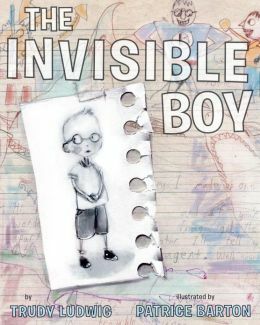 Trudy Ludwig masterfully tells a heartfelt story about a boy who wants to belong, but is ignored by others. Even his teacher doesn’t pay a lot of attention to Brian because she has to deal with other high-maintenance children in the classroom. Brian is kind-hearted and finds his own way to make a friend and gain the acceptance of the other students. Ludwig’s book is an excellent resource for any parent or teacher looking for material that addresses shy and quiet students. It is isn’t preachy and Brian solves his own problem. Patrice Barton’s artwork is creative and perfect for the book. The cover is in muted pastels which sets the tone for the story. In the beginning pages, Brian is a black and white sketch, while the classroom is shown in full color. When Justin befriends Brian, a little color begins to appear. As Brian asserts himself in the class project he is revealed in full color. This a great collaborative effort between Ludwig and Barton. Resources: Ludwig has included a backpage of questions for classroom discussion and suggested reading lists for adults and children. I received a poster with an educator’s guide, activities and questions for group discussions and goal-setting. Ludwig is a nationally known author whose work focuses on helping children cope with and thrive in the social world. She is an active member of the International Bullying Prevention Association and a sought-after-speaker. Visit Trudy Ludwig at her website. Random House has created a free Bullying Discussion Guide for teachers and librarians to use with Ludwig’s books. It includes ready-made lesson plans and activities that follow the common core state standards. Opening/Brief Synopsis: “I know a girl who has a really big mouth. Her name is Bailey. Big Mouth Bailey. She doesn’t know I’ve called her that because I’ve never said it out loud. But that’s what I think.” Maya and Bailey are friends until they attend a sleepover at Keisha’s house and Bailey makes a hurtful and embarrassing comment to Keisha. Over weeks Maya observes Bailey spreading rumors, interfering and causing trouble for many other children. Things get out of hand when Bailey spreads a false rumor that Maya’s parents are getting a divorce. Maya is hurt and talks with her school counselor. As Maya learns first hand, spreading rumors, saying hurtful things and sharing someone’s private information only leads to trouble. Why I like this book: Trudy Ludwig has written an important book that older elementary kids will easily relate to. Mikela Prevost’s colorful illustrations show a lot of emotion, expression and enhance the story. Gossiping and spreading rumors is a big problem among kids. Although the ending is optimistic, Maya isn’t sure she will be able to trust Bailey. I was pleased that Ludwig shows that Bailey’s actions has consequences, and she has to learn how to respect others. 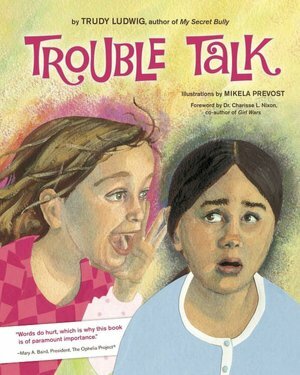 I especially like her use of words “trouble talk” and “‘friendship-tug-of-war.” Kids get stuck in the middle with bullying or relational aggression. I highly recommend this book to teachers, school counselors and parents. Resources: There is a wonderful Forward in the beginning of the book from a psychologist. And, there is an Author’s Note, Questions for Discussion and more resources at the end. There is plenty of information for a classroom discussion. Visit Trudy Ludwig at her website. She has recently written a Wonder Lessons Guide for Random House about bullying. A great tool for teachers and parents to use during National Bullying Prevention Month. You may also want to check out the National Bullying Prevention Center. Opening/Synopsis: “A few months ago, I got sent to the principal’s office again. Only this time, my parents were there waiting for me. Mom looked like she’d just sucked a lemon. Dad had steam coming out of her his ears.” Students reported Katie’s mean behavior towards Monica to a teacher. It was hard for Katie to hear the principal refer to her as a bully. She hadn’t thought of herself as a bully, after all she hadn’t hit Monica. What Katie hadn’t realized was that hurtful words and behavior are also forms of relational bullying. Katie had to deal with the tough consequences of her behavior with a counselor. She had to learn about being a better friend, and find a way to make up for the hurt she had caused. Katie decided to write a journal and turn it into a special book to help kids learn about hurtful behavior from a former bully. 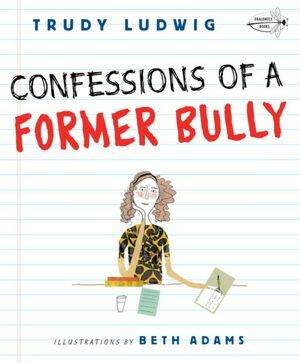 Why I like this book: Trudy Ludwig wrote this unique book for her readers who wanted to know what happened to Katie after she bullied her friend Monica in My Secret Bully. In Confessions of a Former Bully, I liked that the school had an anti-bullying program in place to work with Katie and help her understand how her behavior affected others. Katie apologized to Monica and all the kids, but they didn’t trust her. I like that Trudy left no tidy ending. Katie’s consequences will stay with her until she changes and becomes a better friend. This is a great classroom book that children will relate to as they will be able to talk about the subject from both perspectives. Beth Adams illustrated the book like a journal. It is full of illustrations and very appealing to this age group. Resources : The book provides interesting discussion material for the classroom about bullying. Trudy Ludwig is a member of the International Bullying Prevention Association and is a popular Random House speaker. Visit Trudy Ludwig at her website. She has recently written a Wonder Lessons Guide for Random House about bullying. A great tool for teachers and parents to use during October’s National Bullying Prevention Month. You may also want to check out the National Bullying Prevention Center. Opening/Synopsis: “Katie is my secret bully. A lot of people would be surprised to know this because they think she’s my friend. And she does act like my friend…sometimes.” Monica and Katie have been best friends since kindergarten. Monica enjoys being around Katie when they have fun together. But at school, Katie is just plain mean. She gossips about Monica, threatens her when she plays with other kids, and stakes a claim on her friends. Monica’s mother confronts her when she doesn’t want to go to school. Mom shares her own experience with a bully. With Mom’s support, Monica musters the strength to stand up to Katie with interesting results. Why I like this book: Trudy Ludwig has written a moving story about emotional bullying among girls. Abigail Marble’s illustrations are emotive, colorful and support the story. Since Ludwig wrote this book, bullying continues to increase among girls. It takes many forms “exclusion, humiliation, manipulation and name-calling.” There are many reasons why, but social media hasn’t helped the situation. Trudy has tackled a poignant subject about relational bullying/aggression. The book is an important read for kids, for teachers and school counselors who have or are creating bullying prevention programs. 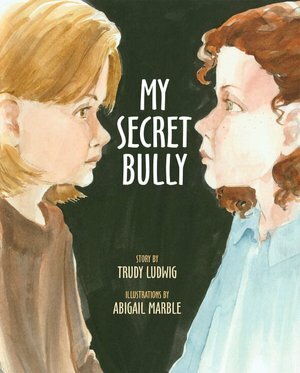 I’m featuring Trudy’s books because they are a culmination of what she’s learned about bullying as an author. She is a member of the International Bullying Prevention Association and is a popular Random House speaker. On Monday I will review Confessions of a Former Bully, which brings closure between Katie and Monica. It is written as a journal. I will end with Trouble Talk next Friday. Last spring, I featured her book Better Than You, a book for boys about bragging and hurtful behavior. Resources: The book provides a message or parents and teachers, and interesting information for victims. There is also a guide for classroom discussion and other resources. Trudy Ludwig is a member of the International Bullying Prevention Association and is a popular speaker. Visit Trudy Ludwig at her website. She has recently written a Wonder Lessons Guide for Random House about bullying. A great tool for teachers and parents during October’s National Bullying Prevention Month. Opening/Synopsis: My neighbor Jake can be a real jerk – always letting me know that whatever I do, he can do better. Don’t get me wrong. Jake is great at practically everything he does — especially sports. Me? Not so much. I mean, I know I’m good at writing stories and playing the guitar, but when it comes to basketball, I have to practice a lot just to be a decent player. Tyler’s friend Jake continually boasts about his abilities, making Tyler feel bad about himself. It isn’t until Tyler’s Uncle Kevin compares Jake to a “pufferfish” that blow up its bodies to make themselves bigger than they are. A new neighbor, Niko, helps Tyler see that Jake is the one with the problem. Niko has the same problem with Jake. Both boys become fast friends and really learn that friendships are supportive and encouraging. Although the boys try to include Jake, he rejects their invitation. Unfortunately there is no tidy ending, as Jake doesn’t know how to change. Trudy Ludwig is the author of seven books centered around sensitive issues children face at school. Her books are favorites among teachers and parents. She has received the Mom’s Choice Gold Award. She’s an active member of the International Bullying Prevention Association. Adam Gustavson’s illustrations are rich, colorful and full of emotion. He beautifully captures the feelings of the characters. What I like about this book: There seems to be an attitude growing among kids. Some call it boasting, arrogance and lack of empathy. It has fostered a generation of kids that are insensitive to the feelings of others. They brag about their achievements, possessions and grades. The list is endless. Ludwig’s book sheds light on an ever-growing problem among kids today. Self-worth is at the center of the problem and children should feel good about themselves because of their inner qualities and not their accomplishments. Activity: You don’t need to look any further than this book, because there is a wealth of information for parents and teachers written by an expert in the Foreword of the book, and in the Author’s Note About Bragging and Boasting in the back pages. She gives suggestions to help children turn painful encounters into positive life lessons. And, she has a Questions for Discussion section for parents and the classroom. She also includes a list of Recommended Books for Adults, so they can work with their children.